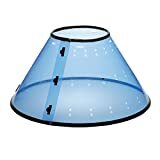 The Elizabethan Collar, or "E-collar", is a hard plastic recovery collar that keeps a pet from being able to turn its head to chew a wound or its body. 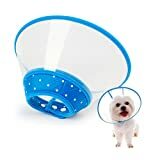 The Elizabethan Collar is probably one of the least favorite pet products, both for owners as well as animals. 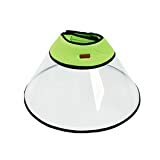 It's unpopularity can be seen in the many names it's called - the cone of shame, the lampshade, and the pet radar dish. 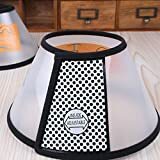 Nonetheless, the Elizabethan Collar (or newer design alternatives) is an essential treatment regimen for recovering from surgery, and for a variety of injuries and skin conditions. Newer, more dog-friendly types of recovery collars are now available, though their effectiveness (and cleanliness) have received poor reviews.